The summer has been a hiatus from my own writing, but that doesn't mean I haven't been playing with words, plot and character development all along. Since the end of June I have had the privilege of instructing kids, tweens and teens all day long in the art of fiction writing, and Writopia in Westchester has quadrupled with the addition of our Larchmont location, hosted generously by Francine Lucidon at The Voracious Reader. 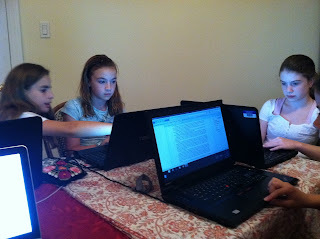 This has been a week of amazing 12-13 year olds, who type faster than I can think. We have some beautiful edgy realistic fiction, science fiction, fantasy and fairytales - even a mystery is being constructed. On Wednesday we were interviewed by Brian Donnelly of The Daily Larchmont, and he wrote an article called: Bookstore Lab Molds Young Readers into Writers that came out yesterday. These tweens will finish their short stories or the first part of their novellas today, and I look forward to working with them more during the school year. So cool to read about tween writers at work! Cheers to Writopia, The Voracious Reader--and you, Lena! Whirly Word huh...will have to find that on my iPhone since I love word games. Great work, Lena. It is fun to see a photo of all of you writers in action. You keep inspiring me! September 21 I start the second Freewriters workshop at the Bridge Teen Center. This time we're doing 5 weekly sessions on short story. Thank you peoples! And Barabara, thanks for stopping by and introducing yourself! I see that you are in the hood - maybe we could connect in person sometime! Cherie, you will LOVE Whirly Word. Amanda, I LOVE that you are getting into this work too! Should you’re on the lookout for glamour with on the cost to take, evaluate Galliano for a hublot replica uk. Whenever you assert "Flowers" and / or Philippine plants buy, interest in a particular wonderful destination whereby virtually all Manilenyos (Filipinos through Town you live Manila) flows to. And that of which typically the Dangwa Plants Economy. Dangwa Plants Economy is believed from a large number of being the primary plants economy through Town you live cartier replica sale. What's more , had become a genuine visitors see whereby a large number of sightseers might possibly amble to the a large number of Philippine plants buy not to mention eyes concerning delightful not to mention graceful plants, and / or pay for theirselves some basket and / or only two. Alright, so what developed Dangwa very fashionable? Back ground. Dangwa plants economy is found at the spirit from Manila, that may be through Dos Castillas st, Sampaloc fake rolex, in the proximity of UST (Or even from Santo Thomas). A large number of need advocated, primarily homeowners who bought examples of the son plants boutiques through Dangwa, that plants economy started to blossom concerning 1976. The forex market was basically therefore encircled from middle-class local neighborhoods. Site was already referred to as for the designate, Dangwa, except for being plants economy, and yet from a harmful fatal that may be given the name "Dangwa". Despite the fact Philippine hublot replica buy manufacturers would not fully gained concerning together with the designate Dangwa originally, families surviving longines replica sale who destination had been together with the designate Dangwa prior to an plants economy.